I am really excited to announce that I am planning to start a new Enamelling Class using facilities at a local school. It will be for 8-10 people, no experience necessary. Message me if you would like to know more. 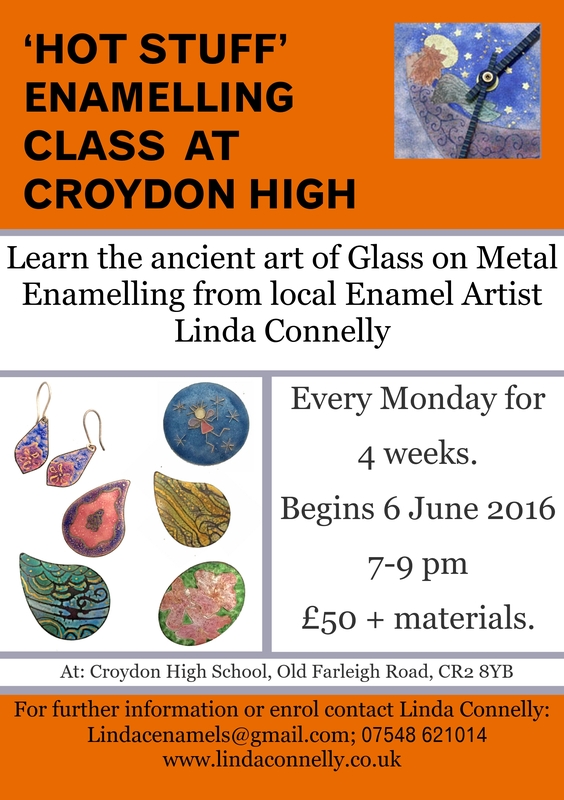 It is an Enamelling class suitable for all levels. Cost £50 for the four classes plus say £1-£2 for materials each class. This will depend on the size and amount of work done. I will plan topics in consultation with students but I envisage they may include sifting, use of stencils, care free lustres and sgraffito amongst others. I am hoping this will lead to a regular class of a 10 weeks each term. 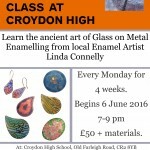 I have just started one if these in Jewellery at another local school following being made redundant by Croydon Adult Education. Croydon High School has lovely facilities and I think it will be very suitable. If you want to enrol I can send you an application form. Places are limited to a maximum of 10 so I can give individual attention. If there is something specific you would like me to cover, please let me know. Hope this helps. Let me know if you need to know anything more. Thank you for your enquiry.